Roy, You’re At The Top – One Of Our Very Best! CONGRATULATIONS ROY, YOU’RE AT THE TOP! Highest Level Of Customer Recognition – John Prince	ALERT – We’d hate to see you lose your status! Verification Of Prize Approval | Approved: You can now go for all 1O Big Prizes! To thank you for being a valued sweepstakes participant, you can now go for 1O big prizes. Plus, see inside for another special surprise! PCH Search&Win I want like my number to be the direct cause of winning this lifetime prize during the first special look event of PCH Gwy. No. 11OOO, $1,000.00 a day for life. First God and if so it is for me. I’m Claiming $1,000.00 A Week For Life Plus $50,000.00 Bonus From PCH Gwy. 11000 on August 31, 2018. I WANT TO WIN IT “ALL! I’M READY TO WIN IT “ALL! I WANT TO WIN $1,000.00 A-Week-For-Life Plus a $50,000.00 Bonus From PCH Gwy. 11000 on August 31, 2018. I’M READY TO WIN IT “ALL ON August 31, 2018. PCH Make “All My Dreams Come “True! I’M READY TO WIN IT “ALL! I hope the number 11000 help me to win the $7, 000 a week for life. yes. yes. yes. yes. Can you help me PCH and Sweepstakes for continue activation and exciting the sequence in my PCHGWY No.11000 lifetime prize $.1 K. Day for life at stake ? Yes I Debra Patterson Claim Gwy 11000, and#10074 on August 31,2018. thank you . DP in Texas. 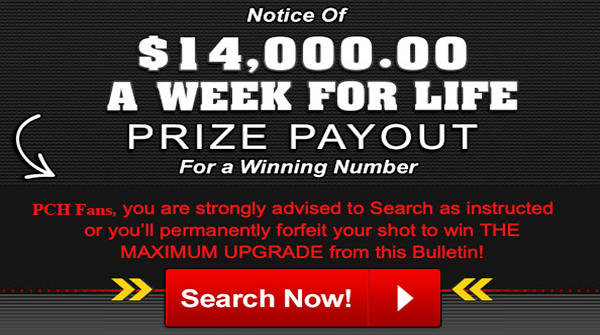 How to Get Your Entry for $7,000 a Week For Life Sweepstakes (GWY.No.11000) guaranteed minimum of $1,000,000.00. Win $1,000,000.00 in a Second Chance Drawing and you will receive $25,000.00 a year for 29 years and a Lump Sum Payout Payment of $275,000.00 in the 30th year. or Brand New Car Ford F-150 Platinum 2018 value $65,549 (GWY.No.10074) America’s best-selling pickup truck for over 35 years. PCH- I accept the prize number next to the eligible property to earn Gwy. No. 11000 $ 1,000.00 per day for life on August 31, 2018. $25,000.00, prize,$1,000.00 A Day For Life;Giveaway No.11559; and Giveaway No.11000; then enter me in to win Exclusive $7,000.00 A Week For Life! Thanks again PCH and Prize Partrol.God Bless.Yes I want to win and meet The Prize Partrol Team,in Fleming Island,Florida,at the McBride house,on August 31st. WOW! $25,000.00; then $1,000.00 a week for life! ; then enter me in to win,Exclusive,$7,000.00 A week for life!Thanks again PCH and Prize Partrol.God Bless. ROY APPEL TO WIN WINNERS LIST PRIZE NUMBER! Roy, Lifetime Prize At Stake! check	Roy, respond to this Notice and YOUR FORTHCOMING PRIZE NUMBER WILL BE DEPOSITED ONTO THE WINNER SELECTION LIST — the ONLY List of Prize Numbers that Can Win! The Winner Selection List is the Official Publishers Clearing House Record of all entries that are eligible to win a $1,OOO.OO A Day For Life Prize on 8/31/18 from Giveaway No. 11OOO. All timely eligible entries are on this list. BE ADVISED — Failure to respond to this very Notice will result in the forfeiture of your forthcoming Prize Number, thus rendering any potential claim by you to prize money that could be won with said number null and void. A Prize Number unique to one Roy Appel will be deposited onto the Winner Selection List for our upcoming Lifetime Prize Event based on your timely response to this Notice. The Winner Selection List is our official record of all timely entries eligible to win a $1,OOO.OO A Day For Life Prize that is ready to be awarded this August! Roy, bear in mind that the Winner Selection List is the ONLY list from which a winning number can be drawn, so we urge you to respond now. blue arrow	Without your timely entry, this Prize Number CANNOT and WILL NOT be deposited to the list. Just think, a Appel Prize Number on the Winner Selection List! That’s good news because we’ll be selecting a winner very soon and only those with numbers on our Winner Selection List can win when we take a Special Early Look for the winning number in just weeks. Don’t forfeit this opportunity to win $1,OOO.OO A Day For Life! Respond now and show us that you want a Appel prize number deposited onto the Winner Selection List! Strict Entry Deadline: This Notice contains official documentation from the Department of Finance regarding guaranteed and secured prize funds. Please review this Notice carefully and submit your entry before Midnight (ET), July 17, 2O18. Absolutely no extensions will be granted. Pay off my car and other debts and take a vacation. Please enter my entry to win $15,000.00. Thanks! Hello dear PCH I’m claiming my number entry to win this prize $1,000,000.00 a week for life Gwy no 11000 on August 31st. Thanks PCH. thank you God for this day !! YES, I WANT TO WIN THANK YOU!!! It’s PCHsearch&win’s 10th Birthday today. “HAPPY 10th Birthday! I would like to win a Lifetime Prize, Plus join the Birthday Blowout, so here I am continuing before the June 5th (11:59 PM, ET) deadline. Today I received TWO Entries from PCHplay&win and PCHsearch&win! I would like to win a Lifetime Prize, Plus I’m joining the Birthday Blowout. I’m being sure to continue to be entered before the June 5th (11:59 PM, ET) deadline. “HAPPY 10TH BIRTHDAY TO PCHsearch&win! “HAPPY JUNE 5th BIRTHDAY PARTY! I received my TWO Entries form PCHplay&win Plus, today is PCHsearch&win’s 10th Birthday Party. Searching today I got two entries. I’m entering today on June 5th before (11:59 Pm, ET)deadline. Today June 5, 2018 I received TWO Entries from PCHplay&win to win $1,000,000.00 Up Front, Plus $1,000.00 A Week For Life Plus, More from PCH Gwy. No. 11000! Plus, it’s PCHsearch&win’s 10th Birthday! Searching today I got TWO Entries to Win $1,000.00 Event Exclusive Cash Prize (PCH Gwy. No. 11631)AND TWO Entries to win a $10,000.00 Event Exclusive Cash Prize (PCH Gwy. No. 11641)! I would like to win a Lifetime Prize, Plus join the Birthday Blowout, so I’m continuing to enter before the June 5th (11:59 PM, ET) deadline. PCH Please Pick Me As Your 7,000 A Week for Life Winner. I hope to be a winner of Publisher cleaning house I’ll keep playing until hopefully it happened one day! Please enter me to Win A $1,225,000.00 Bonus VIP Elite Reward! Would like my “WIN IT ALL” UPGRADE AMOUNT PRIZE ELIGIBILITY from this notice to maybe win PCHGWY no. 11000 on 6-29-18 so that i could help my family with their bills and donate to my favorite charities. Continue activation in my PCHGWY No. 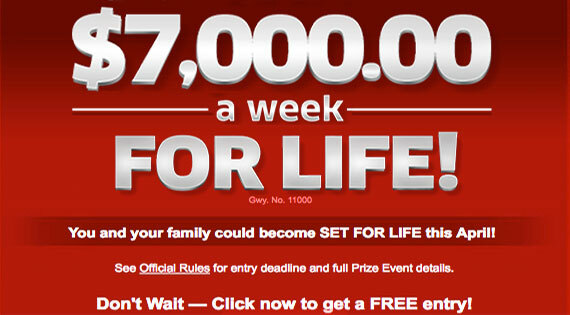 11000 lifetime prize $.7 k. Week for life and $. 1 million cash plus more. I’m very…very greateful PCH and Sweepstakes pit for your help and support. I would love to win any amount of money that I could so please come to my house. Pch search and win $1 million dollars $1 million dollars a week for life on June 30,2018! A ford explore platinum $55,530.00 a home makeover luxury dream vacation 3x entries to win prizes! Vip elite claim my entire to win. Thank you again for the opportunity to win! I really need a vacation so $ 7,000.00 A WEEK FOR LIFE and $10,000.00 Cash would really make it so I could have a great vacation. I still have computer trouble so I can never finish anything. SO SAD. Yes I want to win Giveaway No10025;$500.00 a week for life.Also enter me in to win the Exclusive $7,000.00 a week for life.WOW! Yes I am hoping to meet The Prize Partrol Team in Fleming Island,Florida,at the McBride house on May 31st.Thanks again PCH and Prize Partrol.God Bless.Yes I want to win. I want to claim gwy 11000 7,000 a week for life. Plus 1 million. I want to win it all. Prize Patrol please come to my house. Please Dear PCH Confirm my entry to win this award. Thanks so much for everything. Hello dear PCH good morning. Please confirm my number entry to win this winner selection imminent for $5,000.00 a week for life Gwy no 11000. Thanks for everything. Will!! !this is big ggggg,one, i guess ! 7,000,00 gwy 11000 geez hope win !Hope it answered. 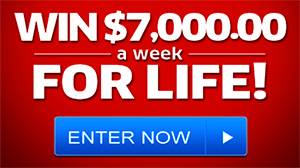 I want to win 7,000 a week for life and $10,000 cash. gwy 1100. I want to claim sole ownership of super prize number. I would love to win the Publishing Clearing House 7000 a week for life it would be a dream come true for me and my family! Yes I will keep entering to win on June 29th. ;$1,000,000.00 plus more,Giveaway No.11000.And yes l will,Love to win $7,000.00 a week for life; also Giveaway No.11000.Thanks again PCH and Prize Partrol.God Bless.Yes repeating myself I want to win and meet The Prize Partrol Team in Fleming Island Florida at the McBride house on June 29th. I’m claiming my entry everday ya no se que hacer please #11000 $7,000,00 a week for life. YES! 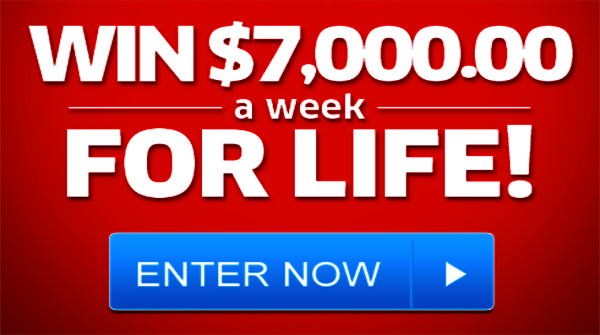 I want to WIN the $7,000.00 A Week For Life! And I need to secure a Prize Number to WIN. Yes, the $7,000.00 is still up for grabs so I hope that the PCH Prize Patrol Elite Team would come to Baldwin City, Kansas for this award. Life-Changing Prize. Please come to my front door and “KNOCK” with the “BIG CHECK” in hand. Yes, i want to WIN this Life SuperPrizes at was for April 27th PCH Gwy No. : 11000. I would like to win $7,000.00 a week for life. YES! i want to be the next BIG Prize Winner with the Prize Number to be given to me. YES! I want to win the huge lifetime prize from PCH Giveaway No. : 11000. Please make my day on April 30th – that is my birthday! Search #1._ PCH Frontpage, Prize Triple Pack, please activate my entry to win $500.00 a Week for Life from PCH Gwy 10025 on May 31st. thanks for a chance to win three prizes. PCH Search & Win, Yellow Alert, Deadline strictly. Entry status with forthcoming Prize Number: Incomplete; please activate my entry to win. I claim this wonderful and great opportunity to win Lifetime Prize $7.000.00 A Week for Life, Superprize is still up for grabs, Giveaway No. 11000. Iam searching from this very notice that this prize can still be mine, I could win; it seems unreal but it is true, I never saw a second chance to win millonaire prize, I do not want it to go out my hands without trying to win, I hope the forthcoming Prize Number assigned with my name is selected in this new award, that for not matching the Prize Number was not awarded on 4/27. Thank you Lord, and thank you PCH for this Big opportunity to win. God bless you all. Happy Sunday! This is 9:45 AM on 4/29/18 and I am Shelby J. Peto, I am responding to the last email in my in box wanting me to claim gwy @11000 to win $7000 a week for life in the second chance winning since there was no winner on the 27th of April 2018 for this prize. Thank you. I am claiming this prize. 7,000 a week for life, up for grabs, responding to the message. YES! 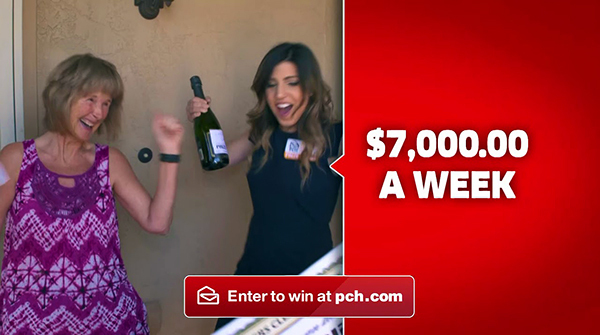 I sure would like to WIN the $7,000.00 A Week For Life from PCH Gwy No. : 11000. Yes, I see it is still Up For Grabs! I sure would like to WIN and CLAIM this Prize for Life. And have the PCH Prize Patrol Elite Team come to my front door with the “BIG CHECK” in hand.